U.A.E. (United Arab Emerites) hosted the 2017 International Final, from 16th to 18th April 2018 in Dubia capital city of Dubai, one of 7 Emerites that collectively form the U.A.E. The Dubai Emerite is the second largest Emerite by area (Abu Dhabi is by far the largest) but Dubai has the largest population with just.under half the total population of the U.A.E. The Dubai Emerite lies at the Southern end of the Persian Gulf. Dubai is famed for its ultra modern architecture (including the 830m tall Burj Khalifa tower) and its lively sophisticated night life. Czech Republic as the 'GMC Global Champions 2017'. Macau as the 'GMC winner 2016'. who handed over the awards to the Macau, Russia and China teams for finishing 1st, 2nd and 3rd, respectively. Portugal, Russia, Senegal, Slovak Republic, Spain and the UAE. The 2014 International Final was held in the beautiful city of Prague, capital of the Czech Republic, from 21st to 23rd April 2015. This was the first time that the Czech Republic hosted this International event. 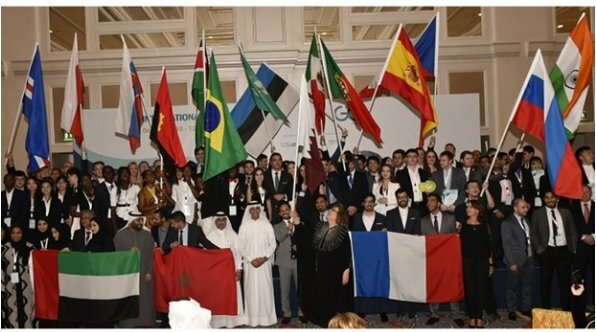 The best manager and student teams from 22 countries from all over the world took part in the International Final of the Global Management Challenge, regarded by many as the 'Intellectual Olympiad' for those who are totally focussed on business and management problem solving. The participating countries were represented by the winning team from their national competition. The 2013 International Final was the first one to be held using the new version of the simulator. This new version was used by all countries in the 2014 version of the Global Management Challenge. It brings significant new decisions that make the competition an even greater challenge for the competing teams and at the same time fully automates (and simplifies) the many tasks that the country controllers must perform. The new decisions are related to green issues, training, production outsourcing. carbon emissions and share issues and repurchases. The winning team is decided by a new criterion: Investment Performance. Launched in Portugal in 1980, by Simuladores e Modelos de Gestao (SDG) and the Expresso newspaper, more than 400 000 competitors ranging from company executives to university students have participated worldwide. The Global Management Challenge, designed and developed in the U.K. by Edit 515 Ltd. organised and marketed by from Portugal by SDG, has become a high profile and visible event in more than 30 countries where it is held, adding prestige to the many participating organizations. The International Final, where the winning teams of each country compete for the World Title, is a milestone and prestigious event, which provides a unique experience of contact between different cultures and the reality of competing at an international level. This is now the 35th edition, all of which have involved continuous development over the years. Most involve subtle but significant changes and alterations to the core models, with decisions changing to reflect current practices and real-life economic coditions. Major improvements and significant upgrades to the Global Management Challenge models are made strategically, creating different challenges that the participants must analyse and solve. You can access the latest International Newsletter (dated March 2015).